1. Pillow and sleeping bag are worked in continuous rounds. 2. 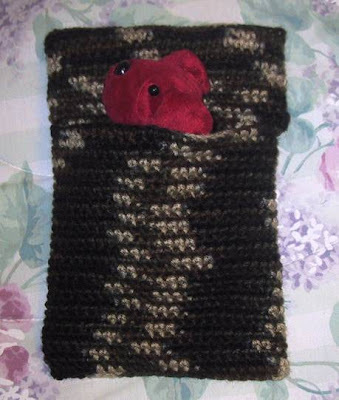 Instructions are for a sleeping bag worked in single crochet. 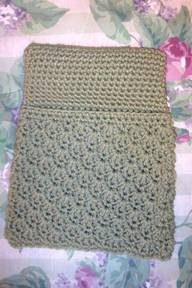 Instructions for working the sleeping bag in shell stitch follow the single crochet instructions. Fold flat and make sure your last stitch of round 40 is at the side. Bag should measure about 10 inches including pillow and have 48 sc. If bag isn’t 10 inches work additional rounds to reach 10 inches. Work above instructions through round 14. Round 15: Beginning at either side, *skip 1 sc, 3 dc (shell) in next st, skip 1 st, sc in next st. Repeat from * around. Join with slipstitch in last sc before the first shell. ROUND 16: Ch 3, 2 dc in same st. *Sc in center st of shell, 3 dc in next sc. Repeat from * around, ending with slipstitch in top of ch 3. ROUND 17: Slipstitch in next st, ch 1, sc in same st. *3 dc in sc, sc in center st of next shell. Repeat around ending with slipstitch in beginning sc. Repeat rounds 16 and 17, until sleeping bag measures 10 inches from beginning including pillow. Ending with round 17. Fold in half, with pillow centered, matching shells and sc. Slipstitch to folded edge. Ch 1 and sc two edges together.